Labor is one of the most pressing issues Oregon nursery growers face today. The May 2016 issue of Digger addressed many of the concerns confronting the industry, including solving labor shortages, improving efficiency, eliminating waste and offsetting rising labor costs. Nursery operations recognize the need for more efficiency in their operations. So, what are the best actions to take to find long-term solutions, at a time when labor is both in demand and limited? To help growers realize these ideas, the Healthy Plants & Bilingual Education program, administered from the North Willamette Research & Extension Center (NWREC), has offered a variety of educational opportunities for the Oregon plant nursery industry for the last six years. The program’s main goal is to help the nursery industry manage pest and disease problems effectively, thereby improving profitability. It is difficult for nurseries to find time to send a large group of workers to an off-site workshop, so the program brings the workshops to them. Topics covered during on-site trainings include a systems approach to plant disease prevention and management, boxwood blight and Phytophthora disease prevention and management. To date, more than 400 workers from over 25 nurseries have participated in these training opportunities. The workshops have been offered free of charge to the nurseries, thanks to financial support from the Plant Health Department at the Oregon Department of Agriculture and OSU Extension professional development funds. This approach allows for the educational delivery to be customized to the specific needs of the participating nursery. In some instances, the participating group will tour the nursery after the class, not only identifying critical control points but also understanding why they matter. Feedback is solicited after the educational activities. The most common comments are to offer longer and more frequent classes with follow-up sessions. These workshops, organized by Robin Rosetta, are held every Thursday in October at the NWREC. They are an opportunity for members of the nursery industry to not only refresh or gain new knowledge from researchers and Extension professionals, but also to exchange ideas and experiences. The series has offered at least one workshop in Spanish every year since 2010. 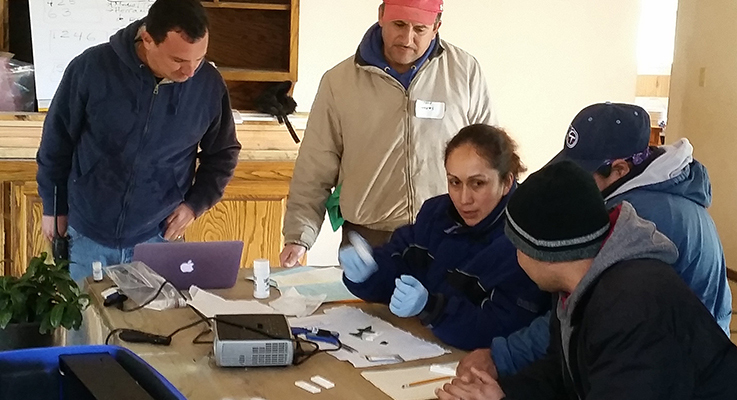 In 2014, three workshops in Spanish were held for nursery workers to help prepare them for the Oregon Private Pesticide Applicator exam. There was remarkable demand for this class, which served as a strong indicator of the industry’s educational needs and interests. We realized that an approach different than the usual, three-hour workshop was needed to effectively cover the material necessary for the pesticide exam. This experience planted the seed for development of the hybrid approach. Hybrid education is the blending of traditional, face-to-face teaching with online presentation of material. This method has been used in college and university courses for some time now, but it has only recently been adopted for Extension education. In 2015, OSU Extension offered the first Spanish-language, hybrid courses, covering pesticide math, laws and regulations, and pesticide label interpretation. One of the goals was to determine whether this is a viable content delivery method for our audience. The course was offered over four weeks, with the bulk of teaching material presented in the form of videos created by Extension educators. All material was accessible online through computer or smartphone. Participants were taught how to access the material during the first meeting, using a set of 25 Chromebooks acquired with support from the Clackamas Innovative Fund. The hybrid approach allows us to reach a much larger audience. Students can watch videos, review interactive materials and complete quizzes at their own pace, without completely eliminating the face-to-face component, which is still important. The majority of the participants in the pilot course — all nursery and landscape workers — had many positive things to say about the format. One thing is clear: this is the way of the future, and we must facilitate movement in that direction. Realizing that not everyone is comfortable with the technology required to access hybrid course material, or any other information available on the internet, we have started a new series of workshops in Spanish called Tecno-Viernes or Tech-Friday. The workshops are held from 3–5 p.m. on the last Friday of every month at the NWREC. The objective of this series is to help participants with technology-related questions and increase their comfort level using smartphones and computers. Topics covered include web navigation, URLs, search queries, as well as how to find reliable sources of information, such as university publication catalogs. Through our experiences teaching these workshops, we are learning that the best way to disseminate educational materials relating to plant health to more people is electronically. Unless our audience is able to find the educational materials online, the whole effort is pointless. That is why we are making a push for more nursery workers to have the opportunity to become technologically literate. This helps increase the viability of hybrid course offerings and the production of electronic educational materials. To further validate our experience and chosen approaches, we are currently conducting nursery worker focus groups in collaboration with OSU’s Extension and Experiment Station Communications. The goal of the focus groups is to obtain a better understanding of what educational material formats would be most useful for the nursery industry, specifically, Spanish-speaking and bilingual workers. Among the different formats we have developed are web-available fact sheets, mobile-friendly fact sheets and applications, printed fact sheets, posters and field booklets. The majority of workers agree that electronic formats, accessible through their smartphones, are the most convenient, especially if they want to be able to access needed references while working. Many admit, however, that knowing how and where to find the online resources may be a hurdle, but not a wall. Field booklets are also highly rated, especially by those with little to no internet access. A work in progress that promises to look further into the future is the development of a Nursery Worker Certification Program. Industry workers have expressed their interest in a program that can give them a more formal, science-based education about plant production and disease management to complement the work experience they already have. Many workers have been working in the industry for many years, but do not have a degree or formal education in plant production systems. Additionally, time and budgetary constraints exclude community college or universities as viable options to expand their knowledge. For this reason, we are collaborating with OSU’s Professional and Continuing Education (PACE) program to create an opportunity for nursery workers to obtain practical education as non-traditional students. The certification program will provide uniformity and consistency to the knowledge base of workers. Nurseries will know — and have an expectation — that workers with certification from our program will have knowledge and skills that will benefit their operation. Development of this certification program is funded by a grant from the Specialty Crop Research Initiative (SCRI). The program is scheduled to roll out in late 2017 or early 2018. The needs of the industry can be reflected in the changing efforts of our Extension programs, starting with traditional workshops like OktoberPest and continuing with the creation of the Healthy Plants & Bilingual Education program, to the implementation of novel teaching methods to reach more people with the hybrid program. Tech-Fridays will enable our audiences to make greater use of our new educational efforts, while focus groups will keep us on track and focused on what is most important and useful for the members of the nursery industry who we serve.